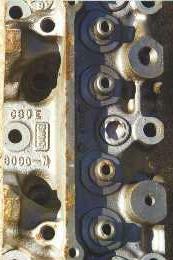 The cast iron cylinder heads used for both 428 Cobra Jet and Super Cobra Jet engines from 1968 through 1970 (part number C8OZ-6049-K) are easily identified by casting number and physical appearance. The casting number, C8OE-6090-N, can be found in the recessed area between the middle two spark plugs as shown in the picture below. If the casting number is questionable, check the number of bolt holes on the exhaust manifold face for additional identification assistance (428 CJ heads should have sixteen bolt holes). 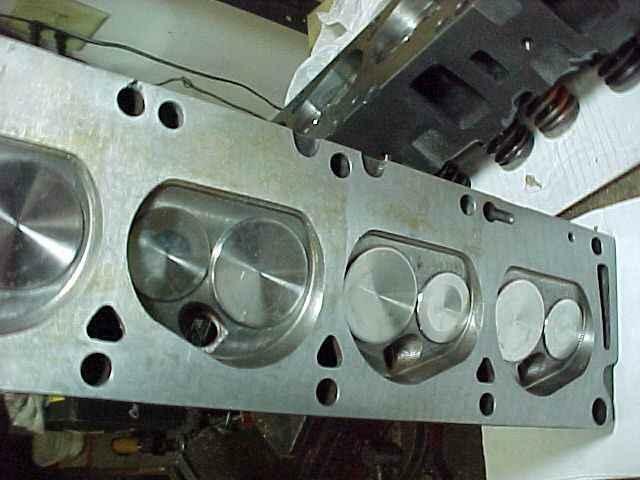 These heads will fit many other FE engines, providing some easy bolt-on horsepower. What has been confirmed, though, is that many of the pre-mass-production cars came with slightly different heads. Use of a 427 low-riser head identified in the Autolite "Hi-Per Parts" book (volume 69 dated 1968, with reprints available from most vendors) as part number C8OZ-6049-F with casting number C8AE-6090-J has been confirmed on at least some of the early "135" series cars. Folks who've seen these heads report seeing casting dates all prior to January 1968, and the -N heads with casting dates after December 1967, so it looks like a switch took place somewhere around January 1968. 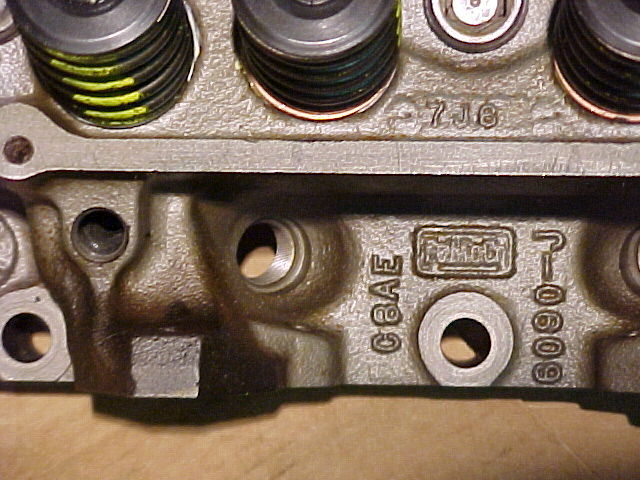 The -J heads were also used on some 427 low-riser applications. They can have 8, 14, or 16 bolt holes in the exhaust face. Interestingly enough the -N heads have also been found with a 14-bolt exhaust face (image provided by Chris Hollern; the two missing bolt holes are circled in green, there's also a broken "ear" on this head circled in yellow -- that missing hole doesn't count); Royce Peterson reports that these 14-bolt -N heads are common to Cougar GTEs with an engine assembly tag date after January 1, 1968. Royce has also found -N heads with an 8-bolt exhaust face and a casting date of 9G24 (July 24, 1969), but their application remains a mystery. 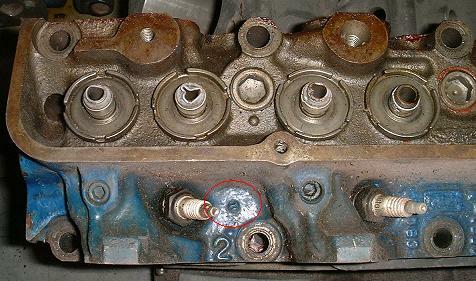 The -N heads typically have four threaded holes (one per exhaust port) for mounting thermactor (smog) air injection tubes just below the valve cover sealing surfaces. 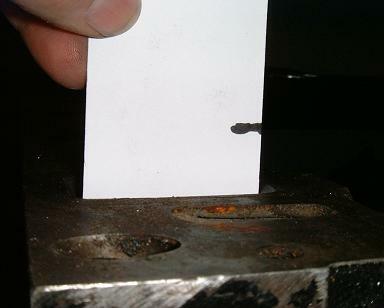 Two such holes can be seen in the picture below. I've received reports from people who have found partial VIN stampings on the rear of the driver's side cylinder head instead of on the flat pad at the rear of the block. 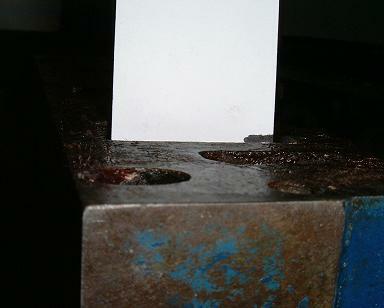 Given normal production line schedules and procedures I have no doubt that the person doing the stamping could put the marks in either place. 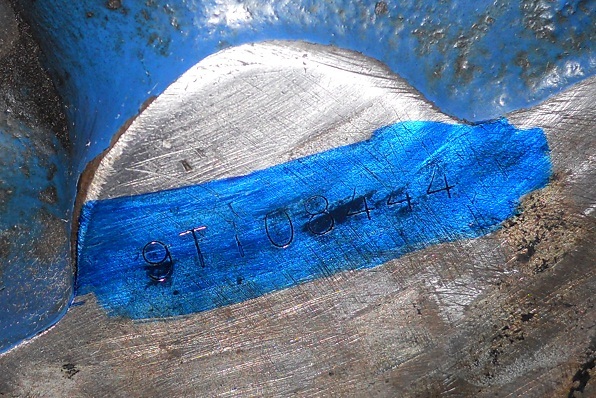 The practice of stamping heads seem to have been more common at the Metuchen (code "T") assembly plant; the head pictured below is stamped 9T108444 (image courtesy of Brian Conway). 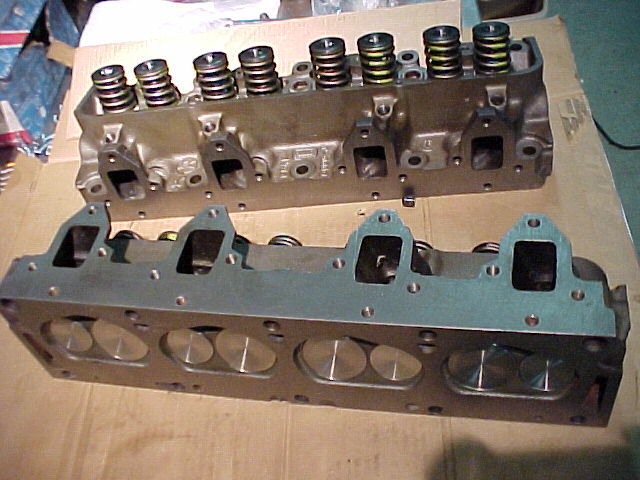 The casting date is visible only when the valve covers are removed. In the picture above you can barely see that there are numbers to the right of the casting number, in between and just to the left of the middle two valve guides. Traditional casting dates of the form "YMDD" appear to be the norm. These are the only FE heads with sixteen bolt holes in the exhaust face. Notice the four holes per exhaust port in the picture below. Thanks to Bill Lewis for taking these pictures of my heads soon after removal for restoration. ...and the view from the top. Ford documentation also lists a head with part number C8WE-6049-A (casting number C8WE-6090-A with date code 8B17 (February 17, 1968), sometimes mistakenly referred to as "Canadian" Cobra Jet heads), but these appear to be quite rare. Thanks to Royce Peterson we now have pictures and more info. 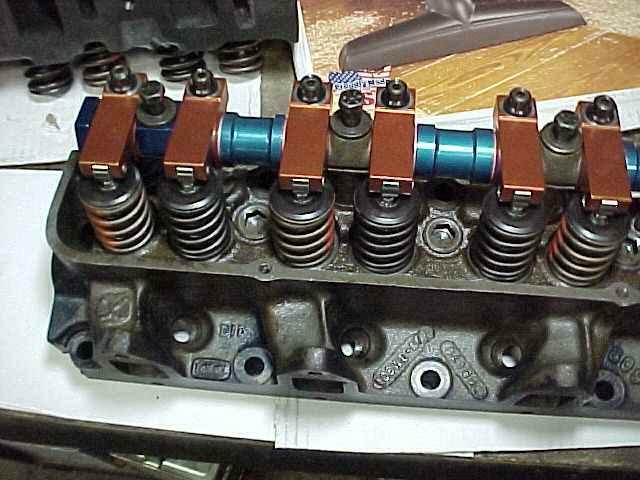 According to Royce, "These heads are race oriented parts distributed directly to Ford factory sponsored competitors with the 428CJ Mustang program in mid-1968. The intake port opening measures to stock CJ size but it is raised in the casting about .200" both top and bottom. The combustion chamber volume is around 72cc. The exhaust ports are 8 bolt pattern". I recently received another description of the "Canadian" heads from Rusty Gillis. According to Rusty, "They are C8OE-6090-N just like the stock one that is why that went through NHRA tech the only visible difference is the clock. The easy way to identify the heads is there are no hands on the clock. The big difference that I know of is in the intake ports". We have the complete story of the "Canadian" heads based on interviews with the men involved documented in another article. Rusty noted that "the heads were installed at Paul Harvey Ford during the 1969 US Nationals at Indy on Hubert's Mustang and Torino and I was there". Editor's note: "Hubert" is Hubert Platt. Intake port size 2.34" x 1.34"
Exhaust port size 1.84" x 1.34"